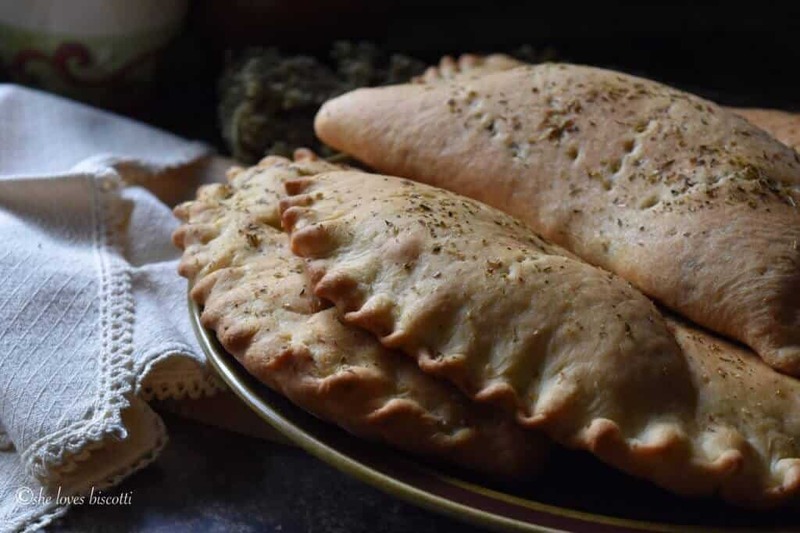 As you can see, these homemade calzones look like half moons and have often been described as stuffed pizzas. Because of their shape, they can easily be eaten while walking, standing or even driving, for the times that you are in a rush. No sticky mess to deal with — the perfect finger food, whether you’re on the go, or watching the big game with friends. I have to admit that calzones were not a food that I grew up with, nor were they a food that appealed to me. Thank goodness it’s a woman’s prerogative to change her mind 🙂 It was only as an adult that I truly appreciated this Italian specialty, originating from Naples. Step 1: Combine the ingredients for the dough and let it rest until double in size. Step 2: While the dough is resting, combine and cook the ingredients for the filling. 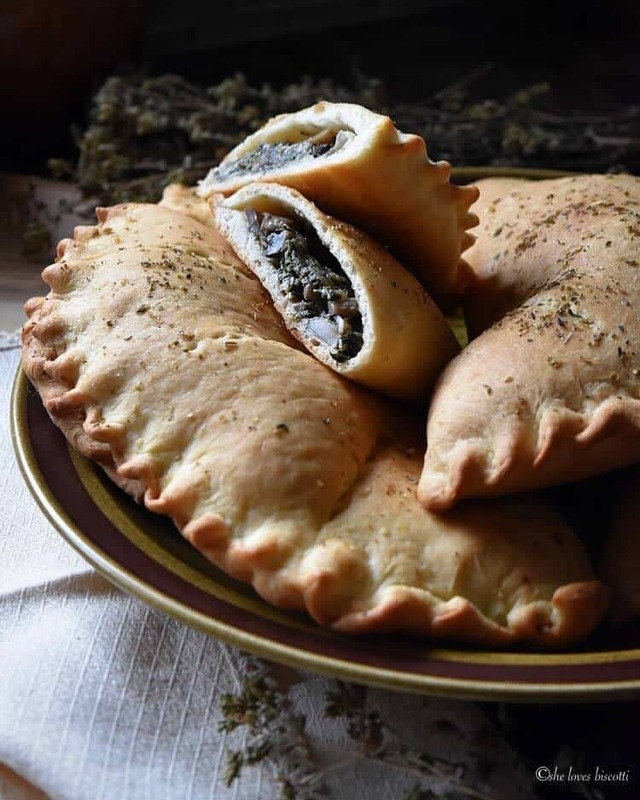 …you just made yourself some spinach and mushroom homemade calzones! A few years ago, I started experimenting with different recipes for calzones. I stopped searching when I found this calzone recipe on this website.. 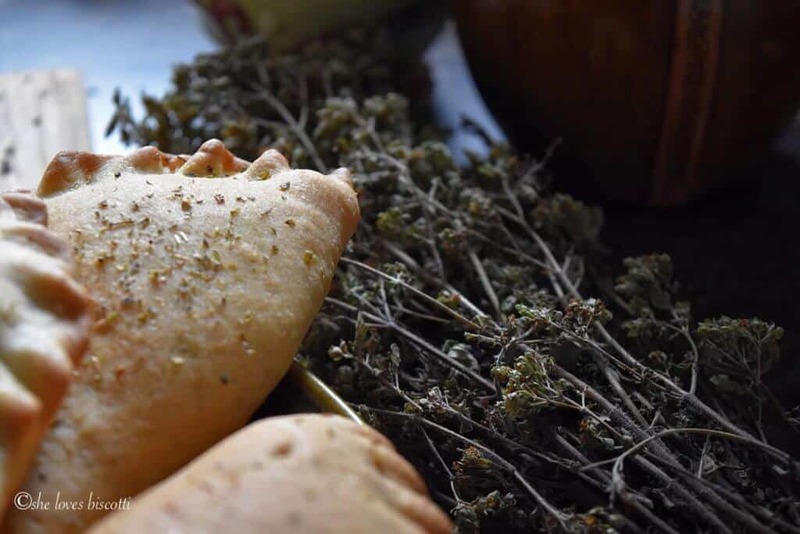 The calzone dough is extremely easy to work with and you can easily choose your own fillings depending on your personal preferences (or if you are like me, depending on what you have in your fridge). My favorite filling includes ricotta, mozzarella, and mushrooms… yum! Just remember to respect the total volume of the cooked filling, which is approximately 3 cups. Otherwise you might end up with too much filling and not enough dough, or vice versa. 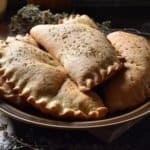 There are so many variations when it comes to these Homemade Calzones, I don’t even know where to begin. 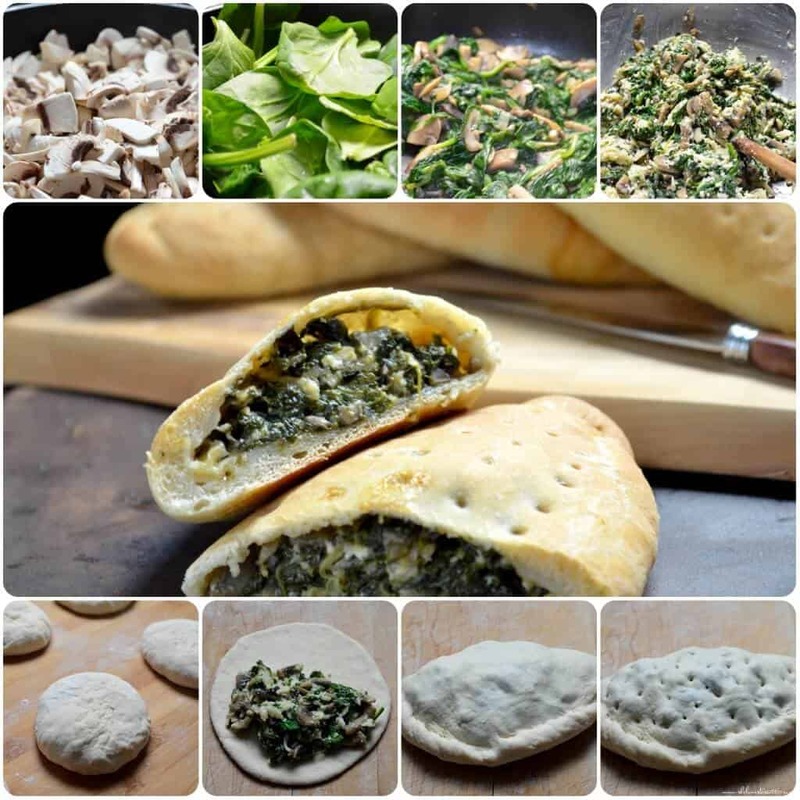 I’ve decided to share with you one of my favorite recipes, a simple mushroom spinach homemade calzone. Once you feel comfortable making this recipe, I am sure you’ll be making your own signature versions. 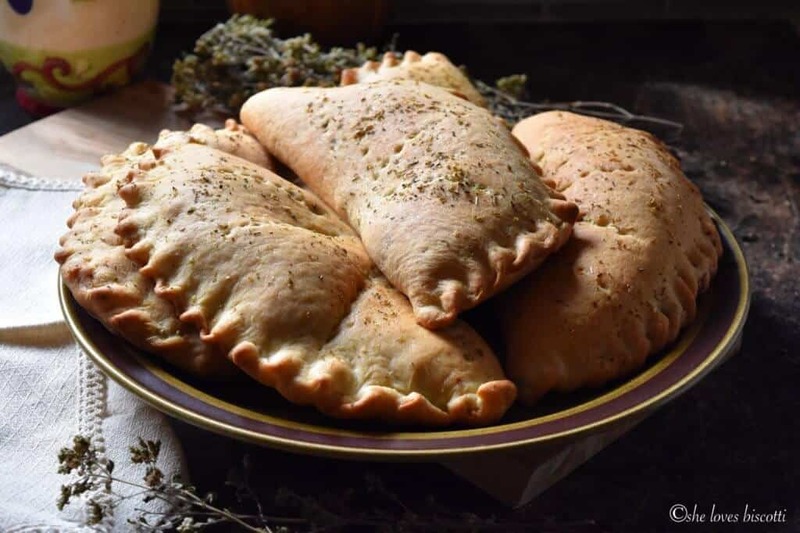 ★★★★★ If you have made this calzone recipe, I would love to hear about it in the comments below and be sure to rate the recipe! You will be presently surprised to learn that making homemade calzones is a lot easier than you think. They freeze wonderfully and are a great solution to that timeless question, "What do I pack for lunch"? Combine yeast, water, oil, sugar and salt. Stir with fork and set aside for about 5 minutes (bubbles will start to form). In the bowl of a stand mixer, measure and sift 1 cup of flour. Add yeast mixture. Combine with wooden spoon until smooth. Add the rest of the sifted flour (1 1/2 cup) and mix on medium speed using dough hook attachment until smooth and elastic (approximately 5 minutes). Alternately, you can knead by hand. Place in a lightly greased bowl. Turn dough over ensuring the entire dough has a thin layer of oil. (I use about 1/2 teaspoon of olive oil). Cover with plastic wrap and let rise for approximately 40 minutes (will double in size). Meanwhile, prepare your filling by adding about 1 tablespoon olive oil in a large saucepan. Stir fry the garlic, onion, mushrooms and spinach. Set aside to cool off slightly. Combine this vegetable mixture with the ricotta and mozzarella. Mix thoroughly together. Pre-heat pizza stone (if using) or line a baking sheet with parchment paper. Punch down dough and divide into 8 pieces. Knead each piece into a ball and then using a rolling pin, roll out your dough, on a lightly floured wooden board, to approx 4-5" circle. Place about 1/2 cup of filling in the bottom half per calzone, making sure to not come within 1/2 inch of the edges. Fold the dough over the filling and press to seal tightly. Brush tops with olive oil. and sprinkle with dried oregano. Make diagonal slits or prick the tops with a fork before baking allowing for the steam to escape. Place calzones on a pre-heated pizza stone or on a parchment lined baking sheet. Bake at 400°F for 20-25 minutes or until golden brown. The bake time will depend on the size of your calzones. Baking the calzones in a very hot oven will prevent the crust from getting soggy. IF YOU ENJOYED THIS CALZONE POST, SAVE IT FOR LATER. So I was skeptical of your recipe as my mom is from Italy. I was pleasantly surprised and tweaked it a bit. I added Italian seasoning to wet mix, I also tried fresh basil in wet mix. I fry mine but am now perfecting by doing a partial fry then bake off. My big question is have you tried freezing them and then cooking? I’m constantly looking for new recipes to try that are ideal for a walking lunch! I am always on the go and find it hard some days to find time to sit down for a meal. 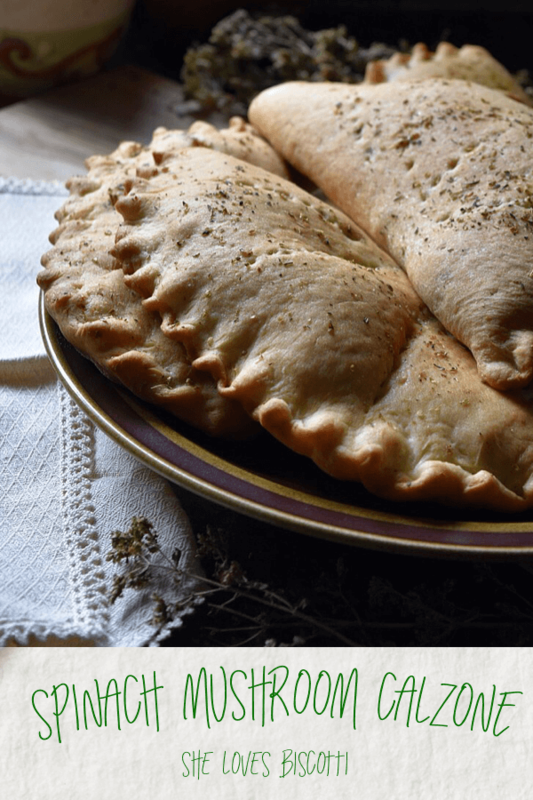 These calzones are the perfect solution! Plus like you mention, the filling can be whatever you like! Great for using up leftover pulled pork, chicken etc! I love your crust, it looks so perfect. I feel like eating calzones now, just can’t wait to make them. Thanks for sharing. Wow, do these ever look good! They remind me of chebureki that we make here. I like that the ingredients are so simple too! Happy Monday, Maria! I make pizza all the time, and have a calzone recipe in the works, too. You’re so right, they are the perfect finger food. Pizza in a sandwich form. Yours look just perfect, and I love that filling! These look delicious! I am always looking for healthy, tasty snacks I can store in the freezer to whip out in a hurry to feed my two boys (and me! ), these look a great idea. Can’t wait to make them! Do you have a homemade pizza dough recipe or would the calzone dough also be used to make a pizza. I look forward to your recipes.